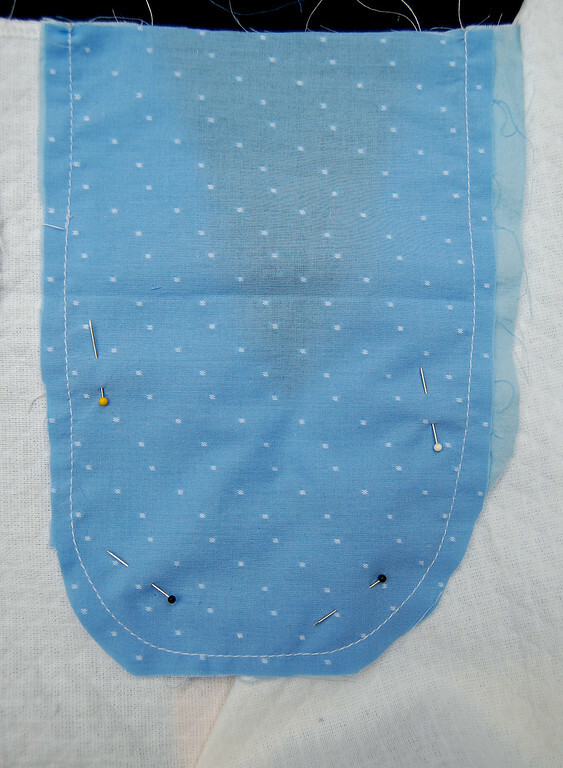 Having learned to make a typical double-seam inset pocket, we will now make single-seam inset pockets. Like their double-seam counterparts, I'm calling them this because they are located along one seam and not because they have only one seam. 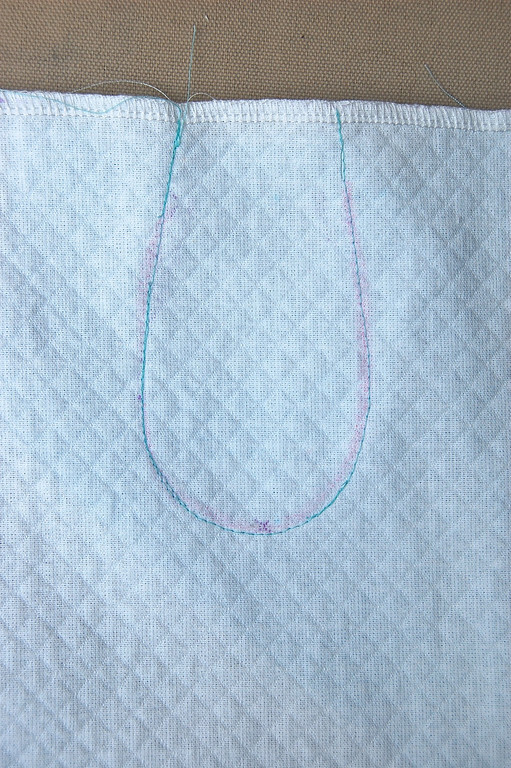 Their construction is identical to that of the double-seam kind. I will not repeat the full tutorial here, but just show some in-process photos of the innards of the pockets. 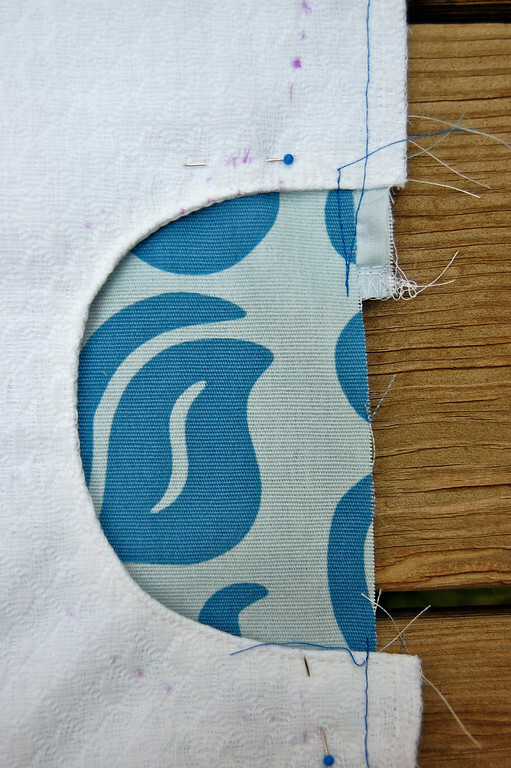 I'm fairly sure that if you know how to make a double-seam inset pockets, you'll be able to do the single-seam kind by just looking at pictures of the completed pocket - you won't even need this tutorial. 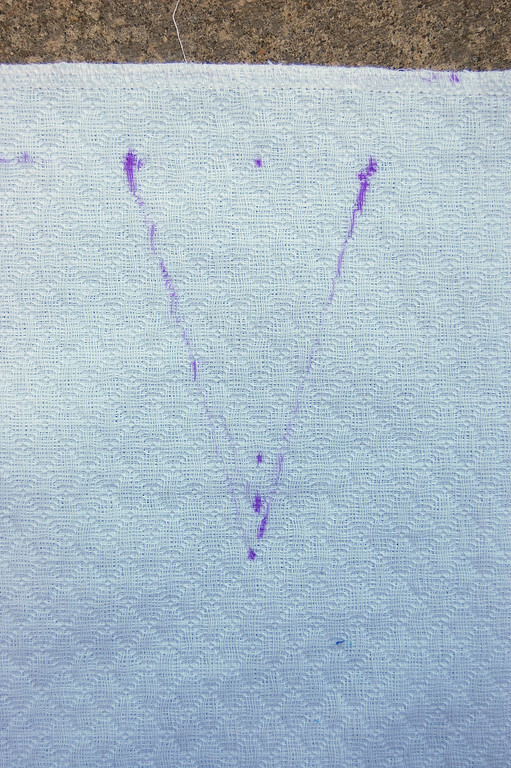 Triangular, flat and commonly located along the waistband of a skirt or apron. 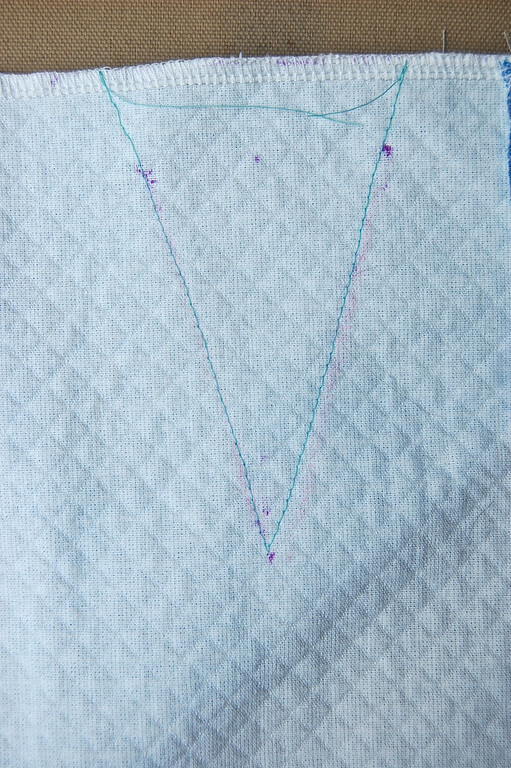 Mark the position of the pocket opening on the garment. Mine is a lousy inexact sketch, with corrections besides, on the right side of the garment. 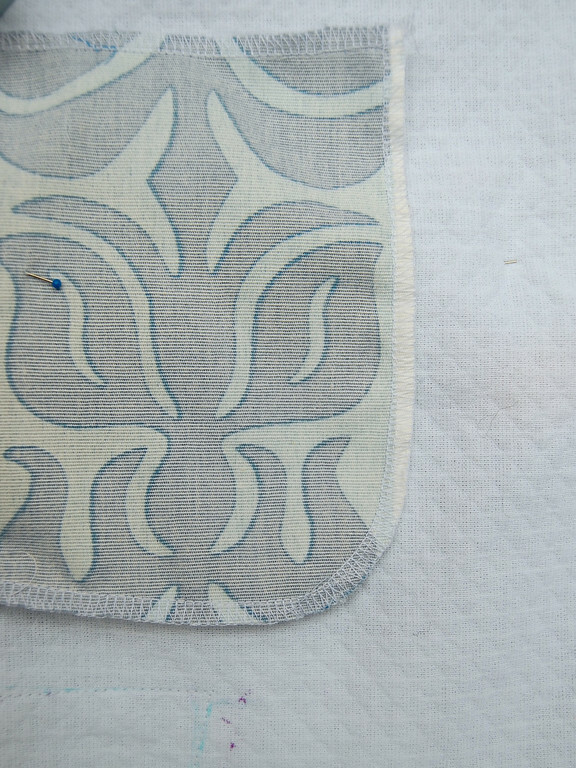 Again, the sewing will be done on the wrong side of the garment, so either use a bleed-able fabric marker, or transfer the lines to the wrong side of the fabric. 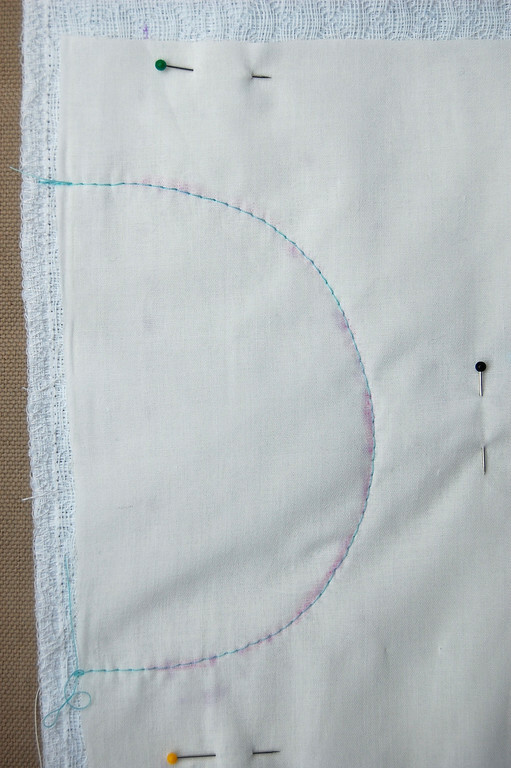 Cut out the pocket opening, understitch the facing or top-stitch the opening, and turn the seam right side out. The facing will now be on the wrong side of the pocket opening. On the wrong side of the pocket opening, pin the lining in place so that its right side is visible through the pocket opening. 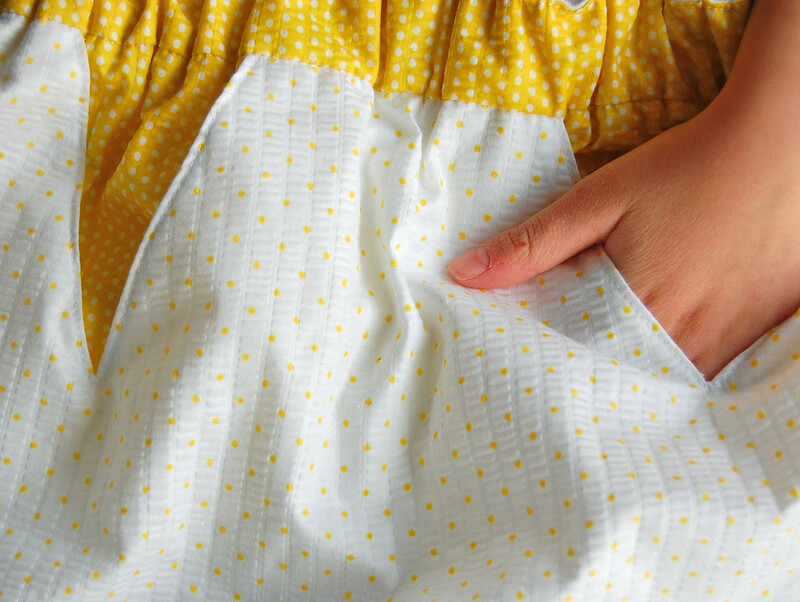 Sew around the edge of just the facing-and-lining double-layer, to secure them together as a pocket pouch. 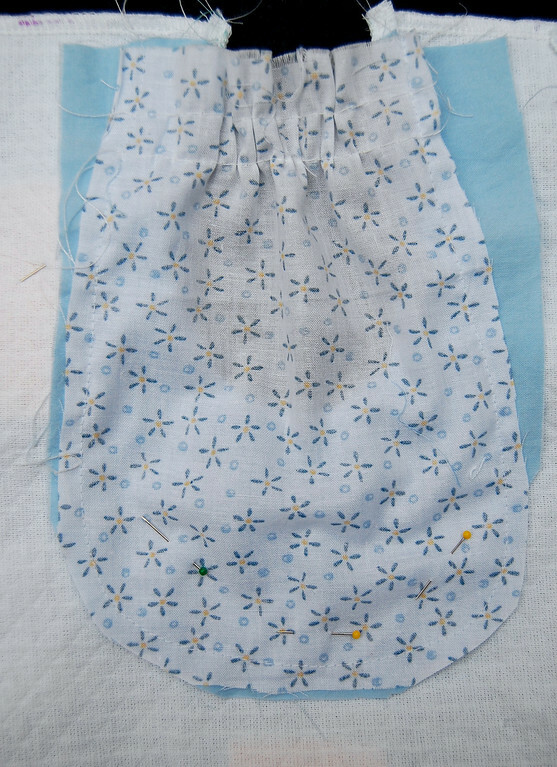 Trim away the excess seam allowance (seen uneven in above photo to show the facing underneath the lining) if necessary and finish (serge or zig-zag) the edge of the pocket pouch. 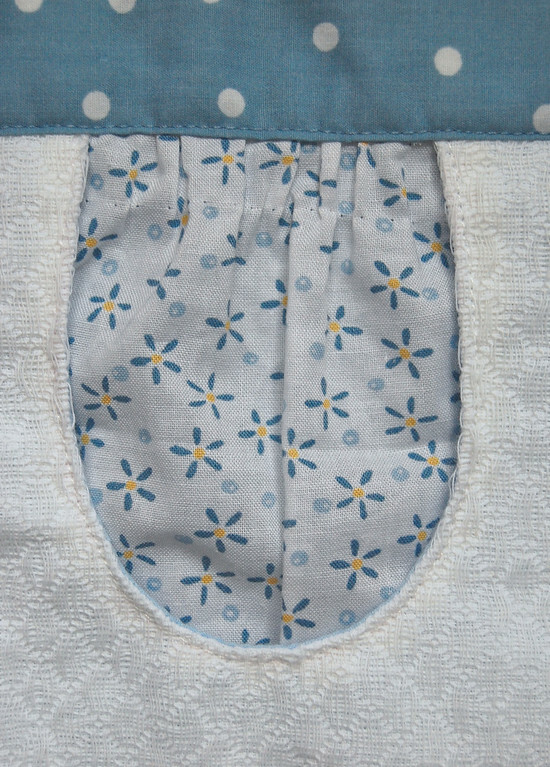 and this is the pocket with its upper edge finished - sewn into waistband. Horse-shoe shaped, gathered and also commonly located along the waistband of a skirt or apron. 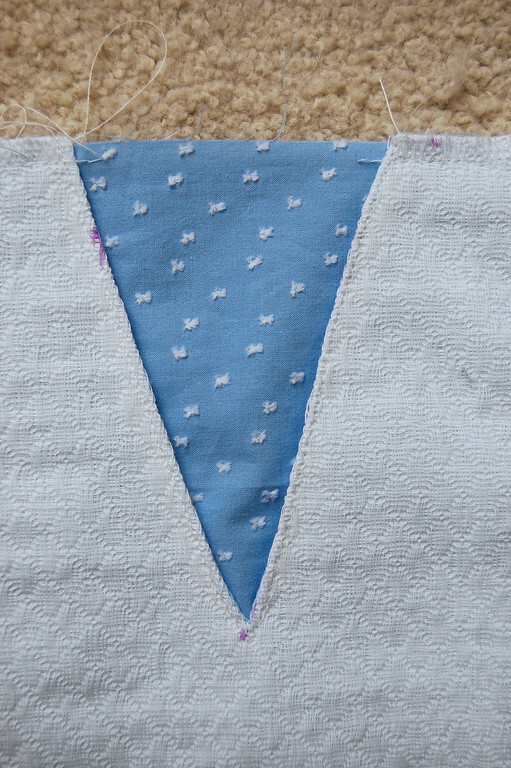 Exactly the same construction as the triangular pocket above. and with its upper edge finished (again sewn into waistband) and the gathering stitches removed. Scoop, flat, and commonly located along a side seam of skirt, dress, jacket or any other appropriate garment. Right side, with facing attached, before the opening is cut out. Wrong side, with the lining attached to the facing, and edges finished. 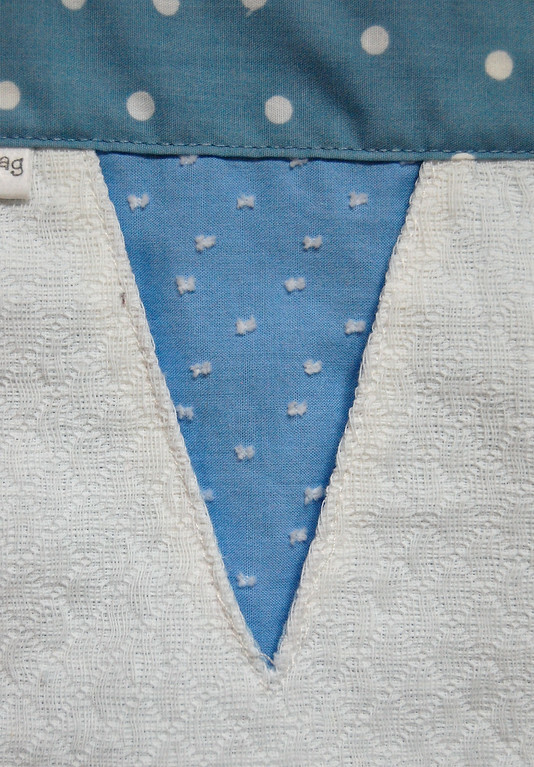 Completed pocket, with stabilizing stitches (blue stitches) along the edge above and below the pocket opening. 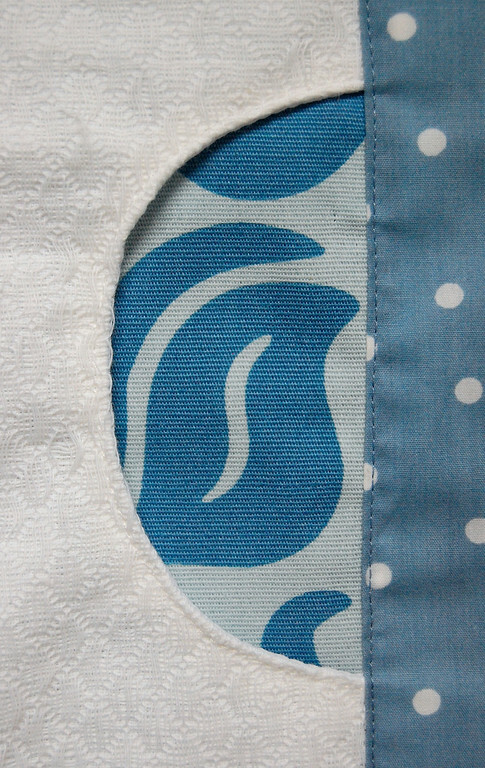 Completed pocket with its side edge finished in a side seam. 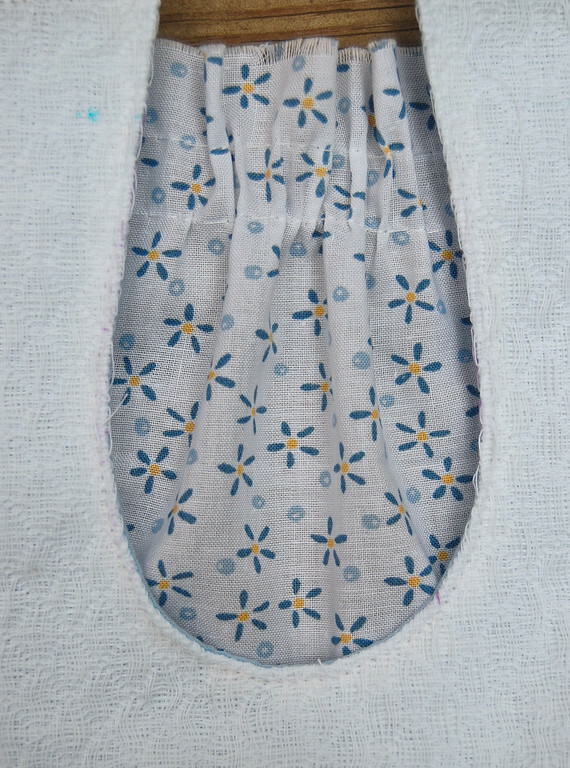 Here are some photos of some single-seam inset pockets on actual garments. 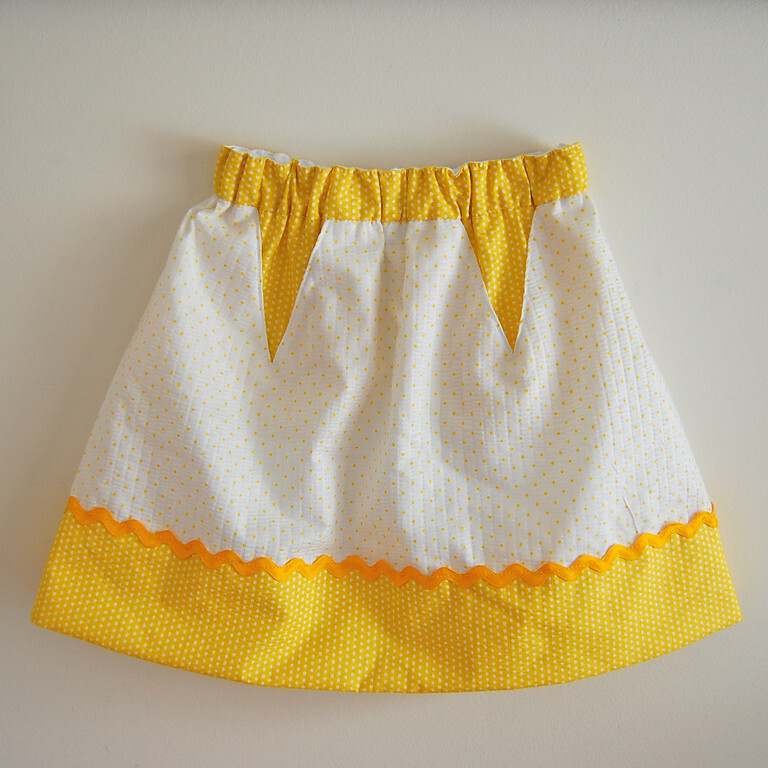 This gathered skirt uses the same fabric for the pocket lining as the waistband, so it looks- but actually isn't- an extension of the waistband. 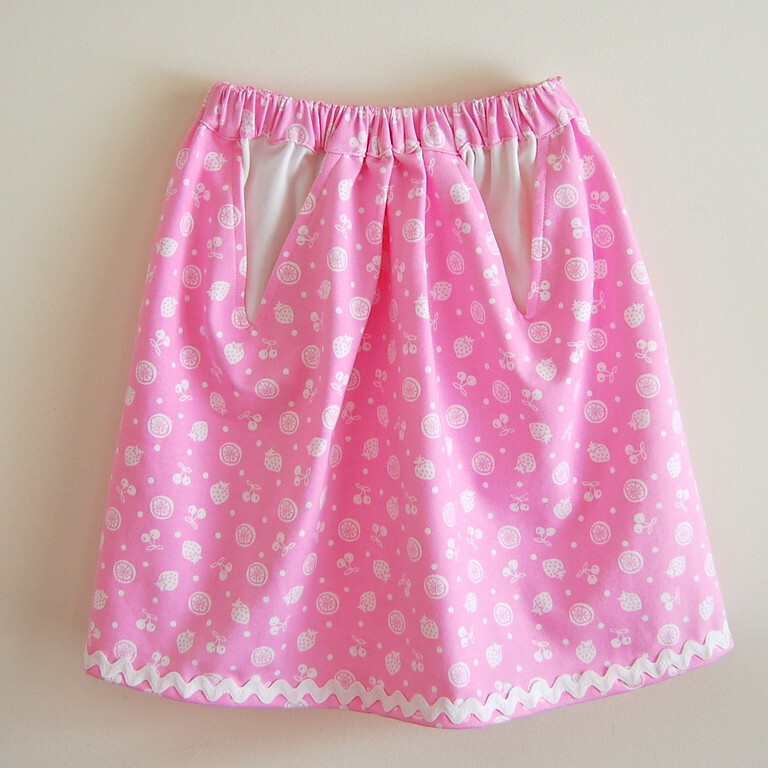 This gathered skirt uses a different fabric for the pocket lining than the waistband. Next: Free-standing/ floating inset pockets. 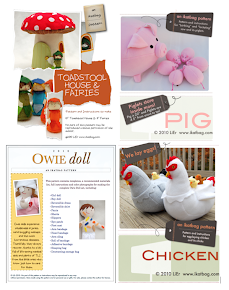 I love the way these look - and I don't think I've ever seen them except on your blog! Thanks for the tutorial! 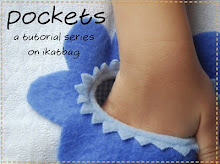 I don't remember ever seeing triangular pockets, very interesting, I can't wait to use them.